The number one thing you should bring with you for a trip to Big Bend National Park is a good map. The map provided for you at the entrance stations is useful, but it shows very little detail. 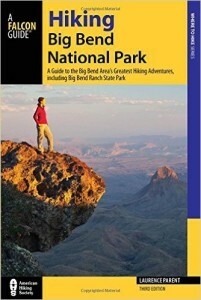 Big Bend National Park Overview Map (2017 version) (2007 version) – This map is a copy of what is given at the park entrance for free. Chisos Mountains Trails and Backcountry Campsites Map – Excerpted from the full guide here. National Geographic Trails Illustrated Map (Recommended) – I always carry this map with me in the park, especially if I’m getting off of the pavement anywhere. It’s far more detailed than the visitor’s map you’ll get for free at the entrance and has some topo detail on it (it’s no substitute for an actual USGS Topo Map if you are in the backcountry). USGS Topo Maps If you plan on leaving the trail, you should carry 7.5 minute USGS Topos with your intended route marked on them. You should also know how to use them, preferably with training by an expert. You can download USGS Topos that are printable on standard 8.5 x 11 paper on the National Geographic website here. The following three books cover the Rio Grande through the park. We recommend your first couple of trips be with a local guide before you set out on your own though. Lower Canyons of the Rio Grande: La Linda to Dryden Crossing, Maps and Notes for River Runners – A guide to paddling the Rio Grande through Big Bend National Park, from La Linda to Dryden Crossing. Includes topo maps and mile by mile descriptions of the river, rapids, campsites and other features. The Upper Canyons of the Rio Grande: Presidio to Terlingua Creek, Including Colorado Canyon and Santa Elena Canyon – A guide to paddling the Rio Grande through Big Bend National Park, from Presidio to Terlingua Creek. Includes topo maps and mile by mile descriptions of the river, rapids, campsites and other features. Great Unknown of the Rio Grande: Terlingua Creek to La Linda, including Boquillas Canyon and Mariscal Canyon – A guide to paddling the Rio Grande through Big Bend National Park, from Terlingua Creek to La Linda. Includes topo maps and mile by mile descriptions of the river, rapids, campsites and other features. Geologic Map of Big Bend National Park, Texas (USGS) – Report containing a detailed pamphlet and modern digital geologic map. Geologic Map of the Chisos Mountains, Big Bend National Park, Texas (USGS) – Report containing a detailed pamphlet and modern digital geologic map, focused on the Chisos Mountains in Big Bend. Geological, Geochemical, and Geophysical Studies by the U. S. Geological Survey in Big Bend National Park, Texas (USGS) – Tectonic history, surficial deposits, volcanic geology, skarn deposits, mercury mines, waters, and other topics. Interactive Dark Sky Map – Learn why Big Bend National Park is renowned for its excellent dark skies.